“The story of Tag + Jug Cider Co. goes back over one hundred years ago to my paternal grandparents, Willie “Jug” and Thelma “Tag” Bryan, whom I barely knew. My grandfather Jug died well before I was born and grandma Tag passed away when I was only 11 years old. Born and raised in Texas in the early 20th century, as young adults, they packed up everything they owned and moved to California, seeking a new life for themselves and for their family to come. Tag + Jug Cider Co. is my homage to them, their sense of adventure and drive to reinvent themselves. Thanks to them, my story started in California. I was raised in the small Central Valley farming community of Tulare, but like them, I moved away from my home to pursue an education, career, and adventure. My journey took me to all over the country, even back to my grandparent’s home state of Texas. California eventually called me home and in 2010, I moved back to the West Coast. I quickly found San Francisco’s eclectic mix of local artists and artisans the perfect setting and inspiration for me and began practicing the fermentation arts and sciences, making beer, and wine (and cider!) in my Mission District garage. In 2012 I started a small winery (Conduit/Divergent Vine), but always wanted to apply winemaking techniques to create a truly dry cider reminiscent of the beverage enjoyed by early Americans. In 2013 I found a family owned orchard in the Sierra Foothills and started making cider from a proprietary blend of their sustainably grown apples. 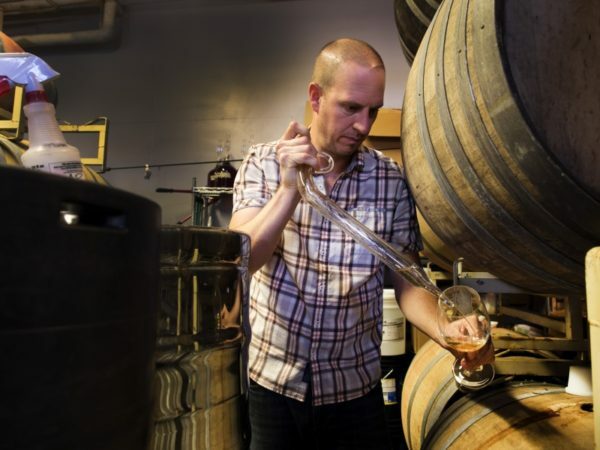 Tag + Jug Cider Co. was born.” – Aaron Bryan.